You might think it’s easy to find palm oil free pretzels. It sometimes is, especially if you stick to original pretzels, not flavored ones. Here’s a list of pretzels without palm oil. We update it regularly. Always read the ingredients for gluten-free pretzels. They often contain palm oil. Know that while you might not see the word “palm” in the ingredients, many pretzel brands contain palm oil derivatives. These include Vitamin E (in the form of Tocopherols), Mono- and Diglycerides, and DATEM. Anything made with palm oil makes my son sick so we seek out palm oil free pretzels and other foods. Support these manufacturers who are making these pretzels without palm oil and palm oil ingredients. Support Rold Gold. 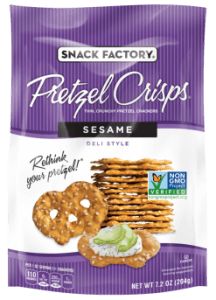 Their original and flavored pretzels are palm oil free. Snack Factory Pretzel makes (most of) their palm oil free pretzels in original and in specialty flavors. Update: Please watch for some of their small snack packs as some contain palm oil, especially holiday varieties. Their Gluten Free Minis Original Pretzel Crisps are packaged for Halloween in 1 oz eight packs. “Palm oil” is clearly labeled in the ingredients. 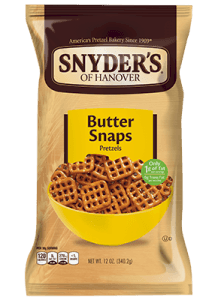 Support Snyder’s of Hanover’s extensive line of palm free pretzels. Their website makes it very easy to find the ingredients for each of their products to determine which are free from palm oil. 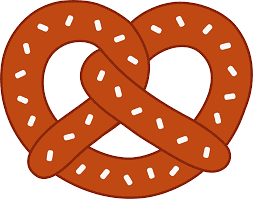 Support SuperPretzel. They make their unflavored soft pretzels without palm oil. We have checked the published ingredients for each of these pretzel products against a list of over 500 alternate names for palm oil. To the best of our knowledge, all of these pretzels are made without palm oil. Before buying pretzels, be sure to check the ingredient labels for palm oil. You will often find it in flavored pretzels. It’s in most all pretzel sandwich snacks. Other times, you may find Vitamin E is added to pretzels in the form of tocopherols. Food manufacturers use tocopherols in pretzels as a preservative. Manufacturers use it often to maintain freshness in foods, including in cereals and granola bars. Sometimes tocopherols are made from palm oil. Unless they label the source, you won’t know if they are made from palm. And of course, you want to avoid palm oil, palm kernel oil, and palm fruit oil. As in the case of one Major Pretzel Manufacturer, you will see this labeled as Vegetable Oil (Corn Oil and/or Palm Fruit Oil). 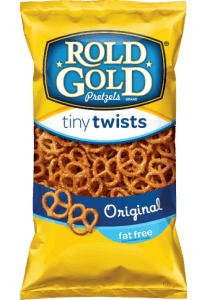 Some of this manufacturer’s pretzel lines are free from palm oil products, but because so many of their regular, “plain pretzels” include it, we are not including them in this list. In addition to avoiding palm oil because it makes some people sick, many people do not want to support palm oil consumption because of the environmental concerns. The demand for palm oil continues to increase. Palm oil is so many processed foods; however, we’ve had some luck finding safe snacks, including pretzels, without palm oil. It’s in approximately 50% of packaged foods which is why it’s very important to read ingredient labels. The issue is always that palm oil goes by so many names. There are over 500 alternate names for palm oil in foods and personal care items. Often, smaller brands who may seem healthy, advertising quality ingredients, are using palm oil to keep their costs down. If you know of any other pretzels without palm oil, please list them in the Comments, and we will add them to this list. It’s very important to support these companies by buying their palm oil free products. Like with all products, there are many companies who use palm oil as an inexpensive ingredient in their pretzels, so read all ingredients. This is to be used for reference only and is not meant to be medical advice. Please consult with your own doctor or healthcare provider if you are avoiding palm oil for health concerns. Please be sure to read ingredient labels if you are looking for palm oil free pretzels. Manufacturers change ingredients. Be sure to always read labels before purchasing.